It was a few years ago that a friend of mine handed me the first book of the Rain Wild Chronicles. 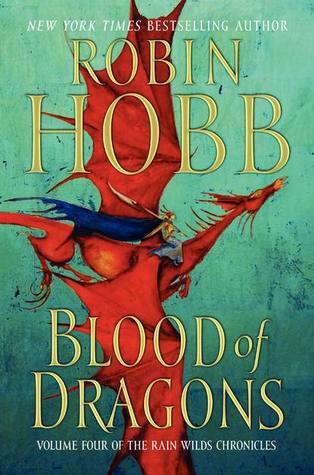 I had never read any of the books that Robin Hobb wrote before, but this was about dragons…so I flew right in. Now, at the end of this series, I still feel a bit mixed about the story that spans four volumes. Robin Hobb has plenty of books out already, divided up in different series. You don’t need to have any pre-knowledge to start one of the series. You do see references to the other books, but none so important, that you have no idea what they are talking about. As a writer, I greatly admire Robin Hobb; her skill in the written language is amazing. She weaves the sentences together so they brush against your mind like smooth silk. Her worldbuilding and storytelling are enticing and immersive. Her characters deep, although she does go a bit wide sometimes—giving attention to every character, while it might benefit from a narrower focus. So far, there’s little to complain, so why do I feel mixed? Well, in my taste the story is incredible slow. Even after the story reached the (four book build-up) climax, I still felt myself wishing they would just get on with it. The dragons are mostly arrogant and selfish, precisely how Robin Hobb intended, I imagine. It’s an interesting aspect and I can see the angle for the story, I just didn’t find that very enjoyable. There’s also little humor in the book to speak off—apart from the end where a few paragraphs the liveships are involved (I wonder if the liveship traders offer more of such humoristic banter, I guess I’ll have to check them out). Giving the seriousness of the story, reading through it truly felt like a long, difficult journey; like the one the dragons and elderlings experience themselves throughout the four books—without many moments of relief. In a way, it made me admire the storytelling even more, but to say it was fun…not precisely. Let’s just say it was as enjoyable as walking through thick mud, where every step takes effort to pull free from the mushy soil of a silver river, surrounded by forests. There’s plenty to see, but it takes some effort to keep going. So, you see why I’m a bit divided. I believe it is an interesting dragon’s tale that gives a great sense of being “real”. Yet, I prefer my books to be filled with other qualities, like humor, mystery and action, to truly find them enjoyable. I can only hope this reflects in my own writing as well. In any case, it will be some time before I return to the books of Robin Hobb. But, I’m certain her skill in relaying the written language toward the reader, will eventually pull me in again; at which point I’ll start another one of her well filled out adventures. To me, those four books were my greatest dissapointment in literature. Although spoilers are inevitable at this point, I urge you to read the previous series, this time preferably in order. You’ll see that Hobb has SO much more to offer.